1. Pre-heat the oven to 180deg C. Grease a 20cm round cake tin and line the base with grease proof paper. 2. Sift the flour and baking powder into a large bowl. Put the sugar and eggs into a large heatproof bowl over a pan of barely simmering water. Using an electric whisk, beat the sugar and eggs for 2-3 minutes until the mixture trebles in volume, lightens and is the consistency of lightly whipped cream. 3. Sift the flour mixture and drizzle the melted butter down the side of the bowl, then gently fold in until incorporated. The mixture should not be beaten or overworked. Pour into the cake tin and place on the bottom shelf for 30 – 35 minutes or until cake is firm to touch and coming away from the side of the tin. 4. While the cake is cooking, make a strong infusion of Green Green Tea, following the instructions on the pack. Remove the teabags and pour tea into a small pan, adding the sugar. Stir over a low heat until the sugar is dissolved. Increase the heat and boil rapidly for 5 minutes until you have a light syrup. Remove 4 tablespoons of syrup and set aside to cool. Keep the rest of the syrup warm while the cake is cooking. 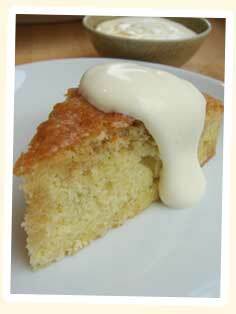 5.As soon as the cake is cooked, remove from the oven and leave in the tin for a few minutes to cool slightly. Skewer the cake surface and drizzle the warm syrup slowly and evenly over the top of the cake. Leave to cool completely in the tin. 6. Mix the reserved syrup with the crème fraiche, then cover and chill. 7. Serve with a dollop of the Green Green Tea spiked crème fraiche.